Add your own questions online – even blend your custom questions with our gold-standard Q&A in e-assignable custom exams – and create the ideal 24/7 clinical knowledge testing solution for your program. 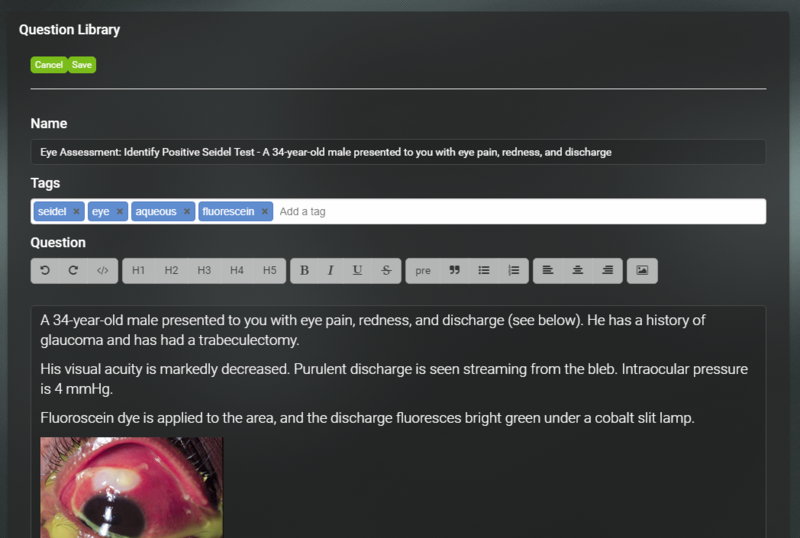 Med-Challenger has introduced new question authoring tools to its online medical education platform. Group program managers and educators can now create, edit, organize, and deploy your own custom questions – all within Med-Challenger. That’s right! With Med-Challenger’s on-demand, exam-based question banks – and the ability to add your own questions – there’s no faster, easier, or more flexible way to create an online curriculum and testing strategy specific to your education program objectives. 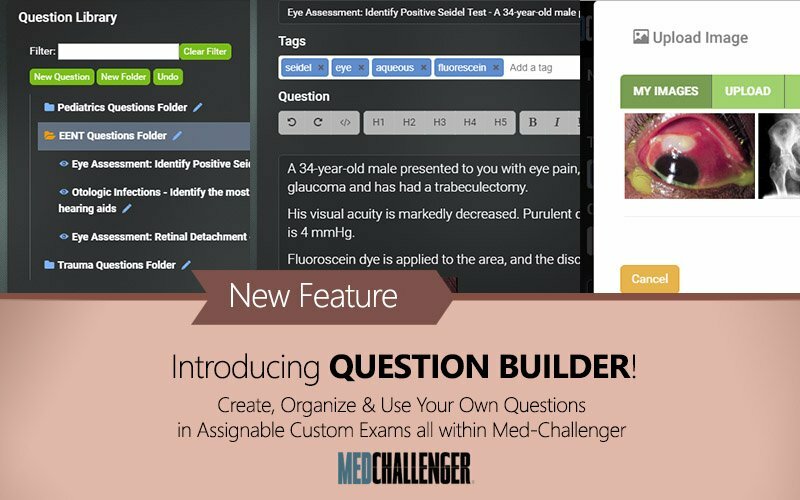 You can even blend your custom questions with Med-Challenger’s gold-standard questions in assignable online custom exams for unparalleled online clinical knowledge assessment – just the way you want. Med-Challenger is the first online education platform to offer this type of question creation and deployment ability to its users. Enjoy a new world of possibilities for improved training outcomes. For more information: request a demonstration online, email sales@chall.com or call us toll-free 1-800-676-0822. Accounts with “authoring” enabled will see an Authoring Tools navigation item in their portal menu. “My Questions“ is the component where you can create, edit, and organize your custom questions. Here’s an example of a few folders with questions placed inside. Entering “My Questions” takes you to your Question Library. This is where you can add, edit, and reorganize your questions. You can search for questions within your library using the search field. Search filters items by text and by tag. Users can create questions and folders. Simply drag and drop your items into folders as you’d like and re-order your questions quickly. Click “Undo” to revert any errant drag-and-drops. To open and close folders, click the folder icon. To edit your folder’s name, click the pencil icon. To edit a question, find the question you’d like to edit (search). To edit a question, click the “pencil” edit icon next to the question’s name. Our WYSIWYG question editor makes things easy. No HTML coding experience necessary. “None” option provides no custom remediation, simply an indication of correct or incorrect. More question types are planned. Craft each question to "stand on its own" in that everything needed to answer the question (e.g. full case description, images, labs) is in the question stem. 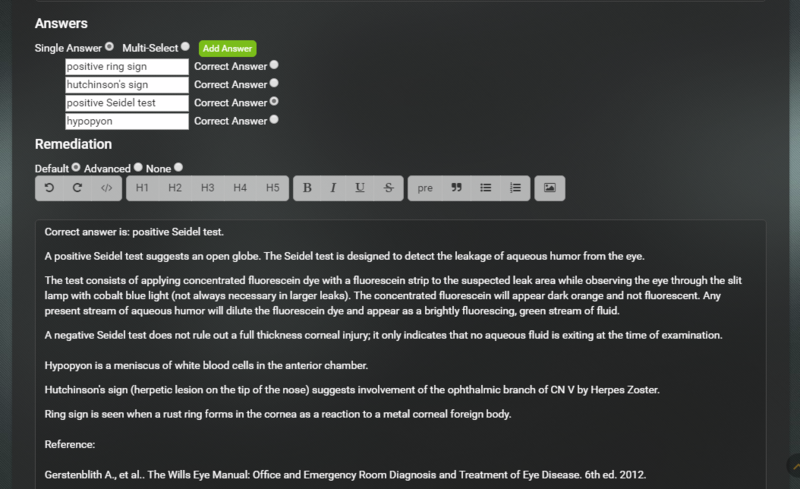 Assessments randomize questions by default, so if you have multiple questions referring to the same case, restate the complete clinical case situation in each question stem. "based on your previous choice"
directions or references to any outside-of-this-stem resources, including external websites. Sequential numbering is automatically applied in assessments. There is no need to add sequential question numbers to each stem. Post-answer remediation (answer explanations) should include detailed case practice rationales including why each respective answer option is correct or incorrect along with supportive content reference information. Save your work before moving on to another question, switching platform features or closing your browser. Save prompts will alert you before you exit the question editor. Question Library Search filters on both Question Name text and any applied keyword Tags. Organize your questions in folders. Your folder organization will be reflected in Custom Exam Builder menus. Select "Custom Questions" as your question source when creating a custom exam. Click "Undo" to revert any errant drag-and-drop actions. There’s no faster way to create an online education program with assignable, adjunct assessment specific to your exact clinical training curriculum, knowledge assessment, and certification exam preparation needs. Coming soon, a more robust Media Manager will allow users more control over media titles and captions as well as use of other media types, such as documents and videos. Set publishing and privacy controls and control what questions are available for use in custom exams and to users and other faculty in your institution. Once custom questions are deployed to users, users will be able to send editorial feedback and suggestions to question authors via “Report Question” feedback buttons. Question authors will receive user editorial feedback via email. Authors can then review and revise their custom questions as required in a timely fashion. Meanwhile, we’ll keep all of our Med-Challenger questions up-to-date in parallel. Use Your Custom Questions in Assignable Custom Exams! Once your question library houses your questions, you can then use your custom questions to create custom exams using our Exam Builder. YES! You can now build customized online exams using your own questions – and then use Assignments to assign them out to your online learners! Your custom questions are their own question bank. You can build an exam using your questions only – or use multiple question sources to create a blended exams featuring your own questions and some from Med-Challenger content. If other authors are enabled under your group institution, you can view and use questions from others – if allowed by the question author. In-group authors can make their questions public or private. Public questions are available to review and use in Custom Exams. Only the owner of a question can edit it. If a question is marked “private” then no one but the owner can see the question. Keeping questions private is also a way to hide any of your “draft” or incomplete questions from others. Try Med-Challenger’s New Question Authoring Tools today. For information about Med-Challenger’s clinical education products and online training platform for clinical training programs, contact Med-Challenger at 1-800-676-0822, sales@chall.com or online at https://www.challengercme.com.